If you've ever wanted an assistant or partner that was as reliable and consistent as a machine, then Volleyball Tutor was designed for you. Volleyball Tutor will increase the quality of your practises by providing consistent sets, passes, and serves for all your drills. You can vary the ball trajectory and speed to produce any desired set or pass. 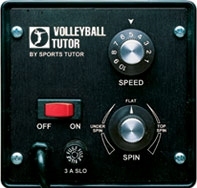 Volleyball Tutor can tirelessly deliver accurate sets, which quickly develops players' hitting skills. It can also deliver serves from low trajectory drives to high floaters. Volleyball Tutor weighs in at less than 16kg, and has a built-in carry handle for portability. The compact design (73cm x 56cm x 33cm) makes it simple to store between practices in the equipment room, or even in the boot of a car. 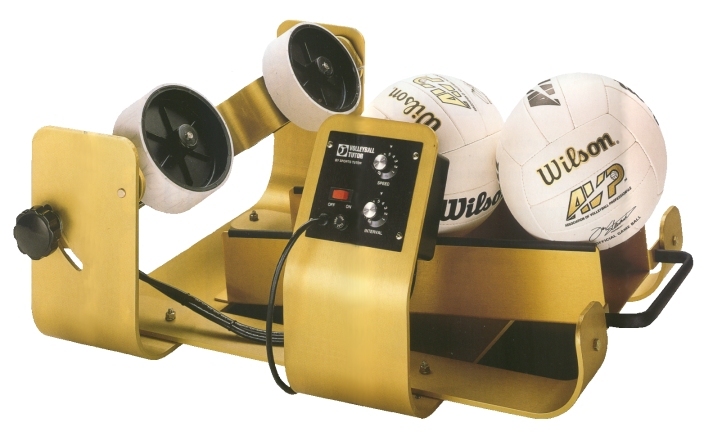 The Gold Model, which includes an attachable Extended Ball Track, can automatically feed up to six voleyballs at intervals ranging from five to twenty seconds. This frees a coach or player from being the designated ball feeder. It also makes it possible for players to practice on their own, either at the gym or even at home in the backgarden. A simple dial controls the amount of topspin or underspin you desire. The combination of a high release point and spin control lets you easily duplicate varying degrees of topspin serves. Other features include large, non-marking casters for easily moving around the court, and assembly/ disassembly in minutes with no tools for improved portability.